SUPERBOWL SUNDAYYYYYY!!!! As I know absolutely NOTHING about football (is that un-American?) I decided I would much rather spend the day outside. I called up a friend, grabbed JoJo and off we went to explore Blue Marsh Lake. There are many trails around the lake, but the map is very basic and doesn’t have a lot of the connecting trails on it. I love kayaking at Blue Marsh, but am not very familiar with the hiking trails so we decided to be adventurous, pick a trail and see where it would take us. We drove around almost the entire lake before we found a spot where we could park – a lot was blocked off for some reason or had a ton of snow piled up in the parking areas. We finally found a place to park and according to the map there was a loop trail near by called the Sensory Trail. We walked over to check it out and saw the trail was only 1/4 mile long – bummer! So we did the loop twice and sort of explored around the area a bit but it didn’t take us long at all. We hopped back in the car – determined to go for a longer hike than that and found a parking pull off that was clear of snow. We got out and started hiking, following the tracks of others. The snow is only a few inches deep now as we had a warm spell and most of the snow from the blizzard has melted away (no snowshoes needed for this trip!) 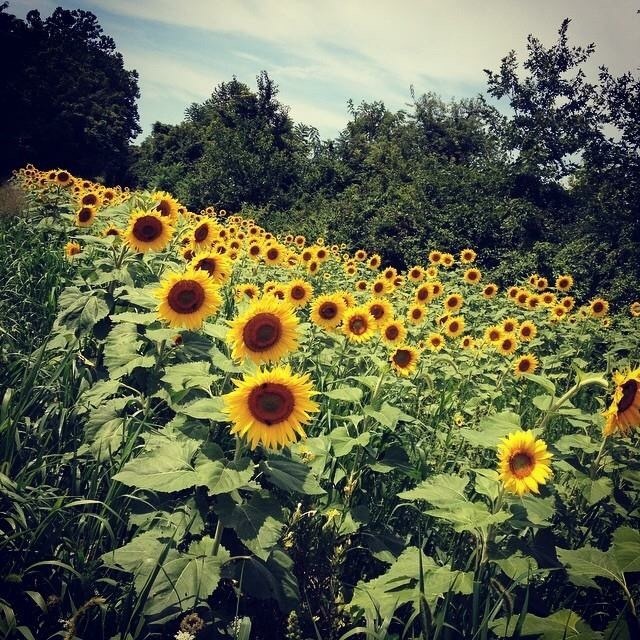 We wandered around the trails and came to some fields – we started around the perimeter of one and came to an area covered with dried up sunflowers – I hiked part of a nearby trail in the summer that had TONS of blooming sunflowers – I never knew they were there before and it was so amazing to see. FINALLY got to use my Snowshoes! !